The 8 drawer tall dresser PDF how-to plans combined with Sketchup Drawing* provides you everything you need to build this classic piece of furniture. The PDF plan includes all the measurements, cut list, and detailed diagrams, and the Sketchup Drawing provides you the flexibility to play with the plans and alter them for your own specific requirements, or if you’re using a wide assortment of possible plugins available to Sketchup users, you can create your own diagrams and cut lists. 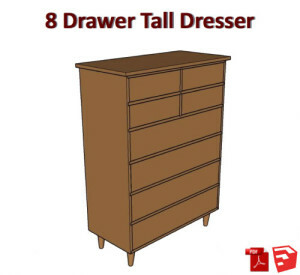 This version of the 8 Drawer Tall Dresser is a downloadable Sketchup file that can be used with current versions of the free Sketchup 3D drawing program. *Don’t have Sketchup? Download the free Sketchup Make version at www.sketchup.com/products/sketchup-make.